A game that looks so much tougher that our midweek game against Grey's on Tuesday night, but our players has proved so many times this season, that they can raise their game in such matches and get the required result. With the news that Mansell is out for sure, Robertson will carry on in the right back role for the team, but I do feel we need to get the defense much more tighter than it has been recently. As much as I like Hodges, he is getting beat far to easily and as a result ends up giving away too many free kicks. Ellis in my view should get the nod and start alongside Todd, as long as Toddy as got over the many knocks he got on Tuesday night. I hope Bucks sticks with Carlisle on the left to start with, he played well there in the first half against Grey's. I don't think Dsane is suited to play on the right and would like to see Carayol starting there and then maybe bring on Stevens later on in the second half. Stevens for me is far better coming on as a sub, in the games I have seen him start he has never looked really effective. Is Sills recovered and ready to take his place back up front? maybe he has not and is why Bucks has brought in Blair Sturrock from Swindon. Who ever starts I would hope we see Green also start the game and have Benyon on the bench, another player I feel has far more impact on a game coming off the bench. I really can't see Christie being a feature in our remaining games and with a new striker on loan I fear he won't make the bench.Its a game we are more than capable of winning and I feel we will come home with all three points. I've never felt confident before going to Field Mill, it just seems one of those grounds that is not for us. Let's hope I'm wrong and don't forget Dave, along with York; they are the team that play football "the way it was meant to be played"
Well I shall be there, fingers crossed. The last time I saw us there the trio of Frenchmen played for us. Old Mamadou Sow did the dying swan running around in puddles on the left, Morike Sako looking like a new born deer on ice in central midfield and Carl "the foot" Priso paddled around with the poise of a three legged giraffe on the flood plains of the Okovango! I think I can even remember little Liam Coleman coming on and playing most of the game underwater. 90 minutes of torrential rain on a sodden pitch. We deserved absolutely nothing and got beat 3-0! I'm going for a 2-1 win with a winner from Carlisle in the 91st minute with Buckle to say something thoughtless after the match. Pretty nasty looking fixture this one. We don't tend to do too well there, and Tuesdays performance doesn't give much cause for immdeiate optimism. Having said that, this team have proved well capable of performing best when not necessarily expected to do so, so who knows what might happen?! Their home form is pretty decent i think, and Marriott doesn't let many past him. 1-1 would be a reasonable return i reckon. 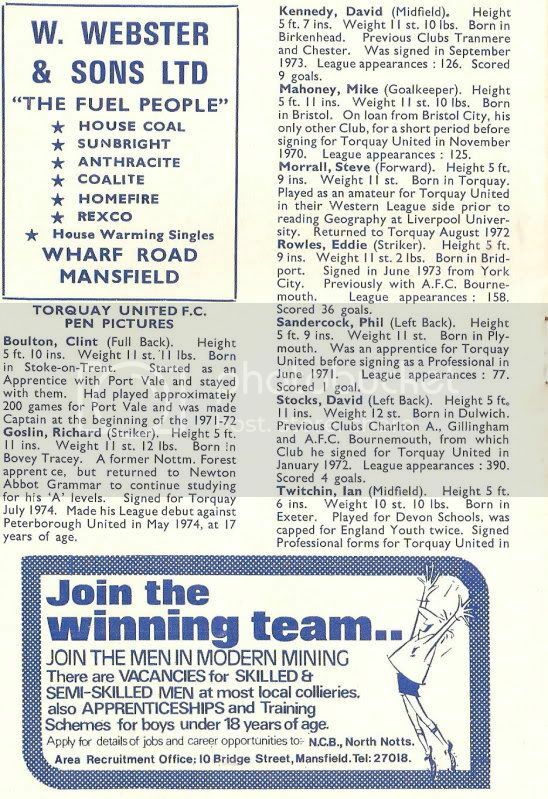 As ever a few treats in evidence.....a tin of snuff for 7p.....a chance to join the men in modern mining.....an opportunity to "shift into gear" with a velvet jacket, loon pants or tank top from Jon.....and United playing in gold (as opposed to the yellow reported by the reference books of the day). The game? A sound thrashing from a strong Mansfield side which went on to win Division 4. We were never in it. My first year at university up the road in Sheffield and one of the sub-plots was going along with new-found friends to see their teams play. 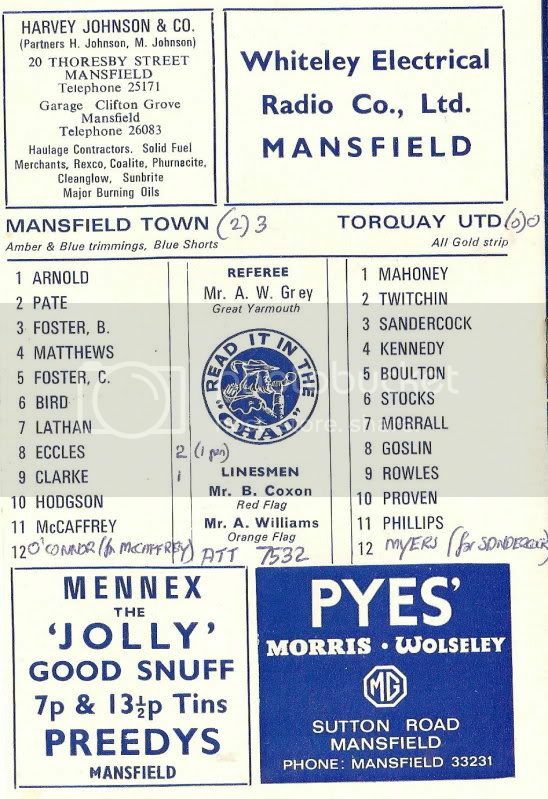 A few weeks later I was back at Mansfield in the company of supporters of first division Carlisle for a 5th round FA Cup tie watched by over 18,000. Who'd believe that now. Not many 6-footers in our side in those days. 1975. The year I emerged from the womb of my mother into the big bad world. Would strongly agree that Ellis should start instead of Hodges. However, think that Carlisle would be better on the right to give a bit more support to Robertson. Dsane scored his goal from the left both on Tuesday and against Mansfield earlier in the season so why not start there? Stevens/Carayol always make good impact substitutions with their pace. I suppose there is the option of playing Thompson in a three man midfield and would like to see him at least on the bench. Up front, as ever who partners Sills if anyone? Prior to yesterday would have said start Green and bring on Benyon later to score his traditional goal from the bench. However, would expect Sturrock to feature at least in part. 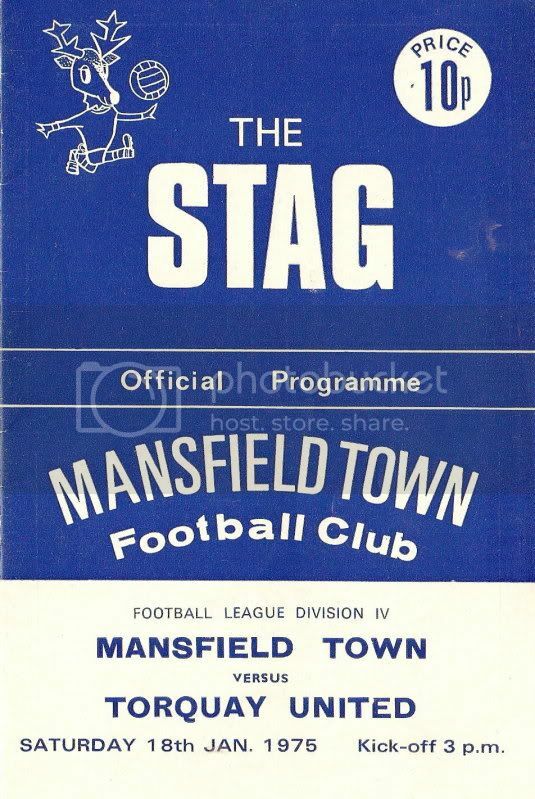 Our win against Mansfield came amidst our long unbeaten run - lets hope that can be repeated. I think Carayol is out with Flu. Agree with you about prior to yesterday it could have been Green & Sills. Now I wouldn't be surprised to see Sturock start, as Benyon has produced his best from the bench and Green hasn't really produced at all yet, shown promise but hasn't really produced. If Sturrock does start then Thompson won't. Also agree with Carlisle on the right and on the left, by default (ie from a short list of 2), Dsane. 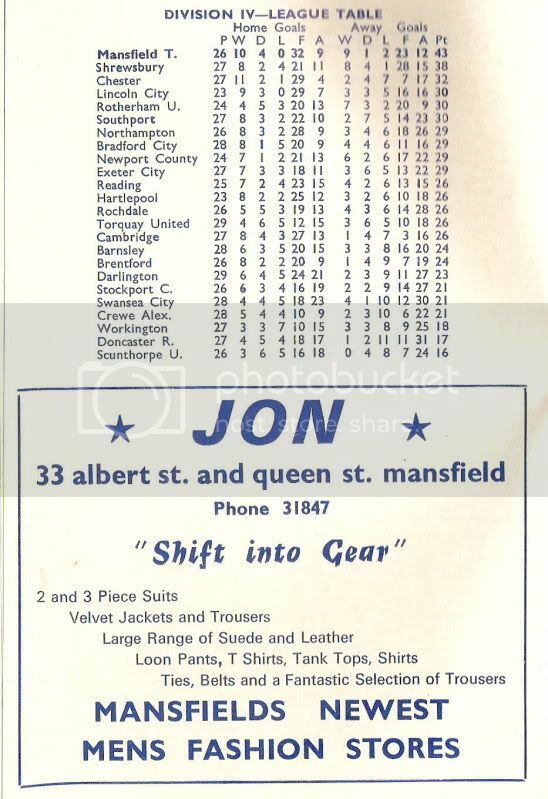 So 'Jon' started life as a tailor in Queen St, Mansfield!! Is that the same feeling we have all had when playing Oxford away. Let's hope we match the result this time. Well I think I'm gonna take the A1(m) up to Mansfield tomorrow. I drove up the M1 last week and there were quite a few miles of roadworks from Nottingham onwards with 50mph average speed cameras. I know people are rarely interested in his interviews, but here's one with Buckle ahead of tomorrow. A couple of people pointed out yesterday the joys of going to an away game. I am about to leave for Mansfield, via Stoke, and if i had the nous how to work my phone i would do a regular update of the day, but I haven't so you will have to make do with this effort and a match report later. Mine usually arrive about 3 days later. The recent problems with my car ( a 3 year old Renault Laguna, the revenge of the French) continue which means a long drive in my works truck, affectionately named by my daughters as the 'loser cruiser'. Another reason why i have to leave in a minute. So i do hope to see you there in time for kick off. Mind you she was in a Manachester nightclub barely 3 hours ago, so best she is ready when i get there. Rumour has it that she had a hissy fit after Paul Buckles comments after Tuesdays game, which she thought were directed to her personally and has vowed never to go to a game whilst Buckle is in charge. Or, she had an argument with the boss (me) and has been dropped rested. Or, she is spending the day making childish T-Shirts ready to give out at the next game, oh just remembered she isn't going to the next game unless Paul Buckle is not manager. Go figure. The truth is that after last Saturdays long slog up North for the Northwich game she has decided to go for some retail therapy in Exeter, but why let the truth get in the way of a good rumour. No stamina these youngsters and shopping on a Saturday afternoon, sacrilege. Anyway enough wittering form me, its time to leave Sunny Devon for the Arctic wilderness of the North, last weeks experience of that bitingly cold wind has ensured i have packed my sunglasses and my thermals. The trouble with a long away trip is the return journey if you leave with no points, so i am going for a repeat of the last 2 away games and another narrow win for the Boys, with another late winner. Probably by Carlisle or Dsane. Wouldn't be surprised if today see's a return to the 4-5-1 formation which worked so well at Cambridge amongst other places. Field Mill is a tough place to go right now, so it'd be understandable if we took a somewhat 'safety first' approach, initially at least. Not sure what the injury situation is amongst our forwards currently? Are Sillsy and Christie injured? If so, Sturrock might get the nod up top, with Thompson in behind him. Wouldn't be dissapointed to see the extra pace of Ellis added to the defence, but i'm not sure Bucks will want to disrupt the Todd/Hodges pairing. It needs time to develop.